Home Video what's in the bag witb Video: Ditching Your M1 Driver To Buy An M3. Wise Move Or Pure Stupidity? 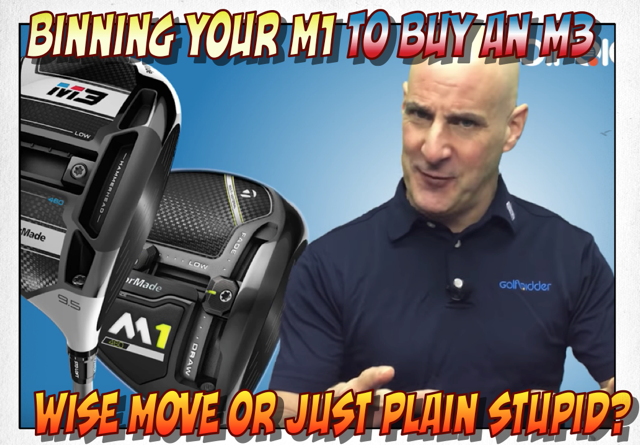 Video: Ditching Your M1 Driver To Buy An M3. Wise Move Or Pure Stupidity? Just say you bought a 2017 TaylorMade M1 driver six months ago and now you see the new M3 being released. Panic ensues. What if this driver hits it further and straighter? Oh my God am I suddenly standing on the tee at a major disadvantage to my playing partners? 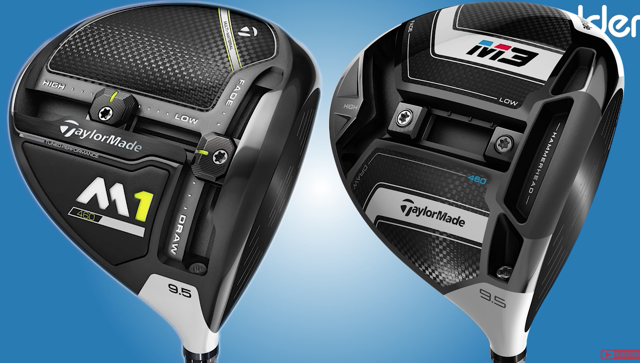 Honestly comparing the new TaylorMade M3 Driver To The 2017 M1. Everybody calm the hell down; I've explained everything and debunked some myths in my latest video for Golfbidder. Should I Get Rid Of My TaylorMade M1 To Buy An M3? First and foremost, if you bought the 2017 M1 driver, rest assured you are not being disenfranchised in any way. You are really talking marginal differences between it and the M3 driver despite what you hear in the marketing and forums. Yes, the M3 has a new incarnation of the moveable weight track, a snappily titled hammerhead slot and the much heralded twist face but trust me when I say this….. the average golfer's swing, path, grip, stance, speed, torsion, hips, rotation, physique play an exponentially greater role in hitting straight drives than any twist on the clubface or hammerhead behind it. You can duck hook a ball out of bounds with the M3 in exactly the same way as you could with the M1.. It's not a magic wand. Having said that, newer versions of clubs pretty much always feature refined technology and improved production processes and there's no getting away from the numbers that say we are all driving further now than ever before. So let's get into the nitty gritty and put the new M3 head to head with the 2017 M1. Looking down at the carbon crown of both, the white section of the 2017 M1 has been slimmed down and changed to silver in the M3, kindof of like the colour of the SLDR-S from a few years back. There's a little rounded bump on the M3's crown too but that's really just cosmetic and the same plus or minus 2 degree loft sleeve is in both. Now the "twist face", which I mentioned earlier, is new to the M3 as opposed to the traditional bulge and roll face of the 2017 M1. I've gone into detail on the theory of the twist face in our M3 and M4 preview videos so check those out but in essence the theory of having the twist face is to help correct off centre hits high in the toe and low in the heel by directing them back towards the centre of the fairway. The twist face sample picture you'll see in lots of the marketing is a dramatization, the actual twist on the face is hardly noticeable to the human eye. It is really on the underside you'll find the biggest difference between the new M3 and the 2017 M1. The two weight tracks that are in a T-shape in the M1 has now become one Y-shaped track. For me it doesn't look as tidy as in the M1 but the new system in the M3 is extremely clever in that it allows even more permutations and combinations for the player who likes to tinker with their set up. The M3 also features that Hammerhead or Power Slot which the 2017 M1 doesn't have. The slot is broken into three sections, again very cleverly done, leaving two ribs in the middle to brace the face. If there is a distance gain to be argued for the M3 over the 2017 M1 you feel it could be here. The M3 is really the first fully weight adjustable driver to feature a power slot, and the theory that such slots help these ever thinner faces to flex more and increase ball speed is pretty much irrefutable. So if you are asking the question…..should I trade in my less than a year olf 2017 M1 for the new M3 and expect to see a big difference? The answer is "No". Should I trade in my 3,4 or 5 year old driver to Golfbidder to invest in the very latest technology in the form of the M3? Yes. And should I trade my 3, 4 or 5 year old driver to Golfbidder then buy a pre-owned 2017 M1 safe in the knowledge that I'm still getting a driver right at the cutting edge of technology. Absolutely! In a heartbeat! I hope this all helps your decision making process and for more information make sure also to check out all our TaylorMade 2018 product previews on the Golfbidder YouTube channel and Golfbidder.com and stay up to date with the very latest on Golfbidder Facebook and Twitter.